The industrial vacuum cleaners, three phase, of the series compact are ideal for general cleaning and to extract dusts and trimmings in industrial work environments classified ATEX Zone 22 Dusts (3D) and ATEX Zone 2 gas (3G) where it is required a reliable vacuum cleaner, efficient and with reduced dimensions. The industrial vacuum cleaners, three phase, of the series compact are ideal for general cleaning and to extract dusts and trimmings in industrial work environments classified ATEX Zone 22 Dusts (3D) and ATEX Zone 2 gas (3G) where it is required a reliable vacuum cleaner, efficient and with reduced dimensions. 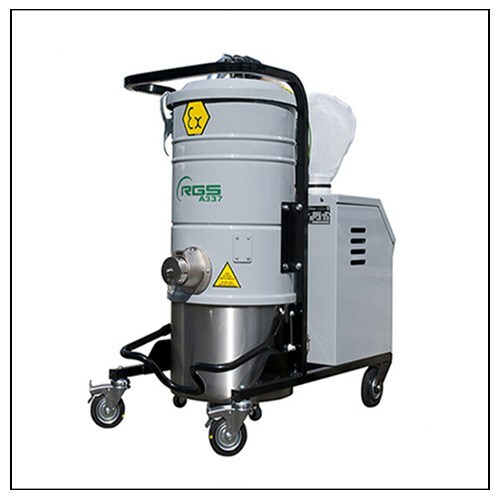 The vacuum cleaner model A337X1.3D represents the ideal solution thanks to its small size and its suction power, in fact in only 46x100x100(h) cm space it contains a 2,2 kW side channel blower, three phase, able to operate 24 hours per day to extract dusts and trimmings in industrial work environments classified ATEX for Zone 22. This vacuum cleaner has been designed, engineered and built in compliance with the directives EN 60335-2-69 concerning the vacuum cleaners and 94/9 / EC for operation in areas classified ATEX 2-22. The emptying of the 29-liter container is extremely rapid thanks to the release system and the filter cleaning guarantees excellent efficiency o filtration in any working condition.